This space has been very quiet for many months as I’ve been working on a deep but carefully curated subscription-based, online Seasonal Recipe Collection. This project grew out of years of developing recipes for CSA farms and their members and teaching cooking classes, all with the philosophy of: fresh produce + well-stocked pantry + a little confidence and creativity = cooking more, eating well and spending less money on last minute trips to the store, take-out, etc. I hope you’ll have a look and consider subscribing. The collection is organized alphabetically by vegetable so you have a dozen (or many more) recipes for each vegetable in one click rather than browsing many different sites to find what suits you in the moment. The Seasonal Recipe Collection might inspire you to try new things at the farmers’ market or subscribe to a CSA–maybe you’ve never picked up a bunch of salad turnips with their lush green tops or purple mustard greens or fava beans or chicory. This collection offers you guidance about each vegetable, storage tips and complementary ingredients and flavors as well as recipes and photos of the dishes. You can subscribe to this collection as an individual but if you have subscribed to a CSA this year, specifically 47th Ave Farm, Sun Gold Farm, Minto Island Growers, Gathering Together Farm or Sauvie Island Organics, you will get access through your farm, or in the case of Sauvie Island Organics, to a customized recipe packet each week. Frisée, sorrel, arugula, parsley and mint. This salad is the epitome of cook-with-what-you-have. Las week I scavenged in my fridge and garden and came up with sorrel, some frisée, arugula, parsley and mint. 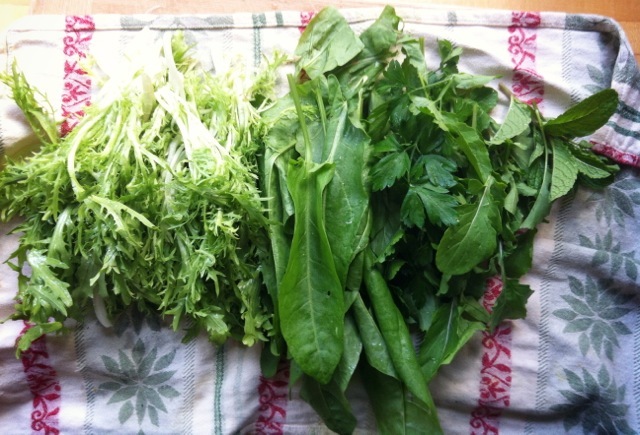 I love to use herbs more like salad greens, using them in quantity and keeping the leaves more or less whole. 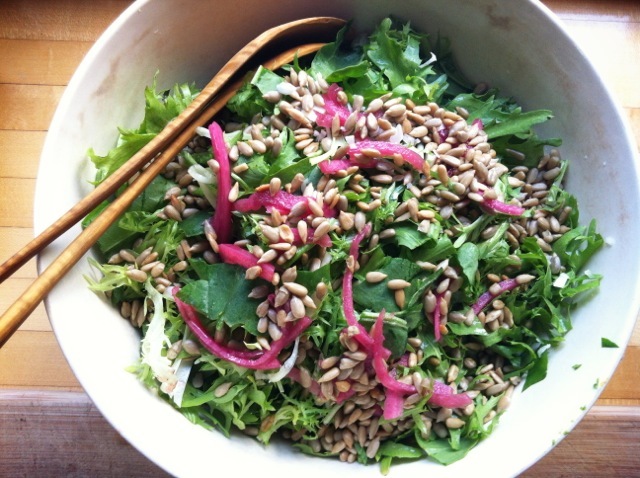 My pantry offered up toasted sunflower seeds and some lightly pickled red onions (just thinly sliced onion in red wine vinegar) and a salad was made! If you don’t have the latter two things prepared you can toast sunflower seeds in 12 -15 minutes at 300 degrees with a little olive oil and salt and slice up an onion and let it soak in vinegar for 10 minutes, in the moment as well. Toss everything but the seeds or nuts together in a serving bowl. Taste and adjust seasoning with salt and/or acid. Toss in the seeds or nuts. Taste again. Enjoy! Happy spring and happy cooking!